All Posts Tagged With: "Pampers"
All about face wipes. I’m call myself the Baby Pampers sensitive and perfume-free wipes (thick care) snob. I use it to remove my makeup and to freshen up when I travel. It’s works really well. 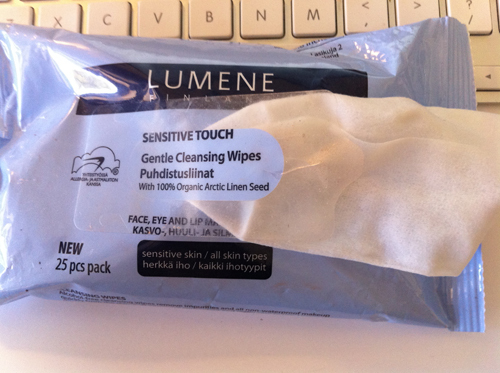 So to add LUMENE Sensitive touch Gentle Cleansing Wipes takes a lot to impress me. I add this one as definitely worth trying. It’s not perfumed heavily, it’s gentle as it claims, and does remove even waterproof mascara. It’s good! Available at CVS. LUMENE Gentle Cleansing Wipes with 100% Organic Arctic Linen Seed and alcohol-free. There are many fancy ways to remove your makeup, such as: lotions, oils, and special wipes. But if you want to stick to the simplest way to remove makeup, Pampers Sensitive Wipes for babies, yes I said it-for babies-will do the job just fine. Pampers Sensitive Wipes are perfect, especially at night when you can’t be bothered getting a whole sink wet with water just for the sake of a clean face. These wipes by Pampers remove makeup quickly and efficiently, they are gentle on the skin, and are fragrance free. If they are good enough for a delicate baby’s skin they are good enough for you. Pampers Sensitive wipes are made with chamomile and pure water, and milk essentials. They are hypoallergenic, and gentler than a washcloth and water. And the price is right: around $5.00 for one pack.